I adore cinnamon and like vanilla extract, I love cinnamon so much that I always add extra to a recipe and rarely bother measuring it. If a recipe calls for one teaspoon, I liberally shake in at least two teaspoons. But I don’t really shake it in, I douse it in. I remove the plastic tops with the cut-out holes from my spice jars because they inhibit the cinnamon free-flow. I’ve been on a bread-making kick lately and cinnamon swirl bread was a natural progression. Although I was tempted to make cinnamon buns, I decided that if I made and then subsequently ate an entire loaf of cinnamon swirl bread in two days, that bread would somehow be better than buns. 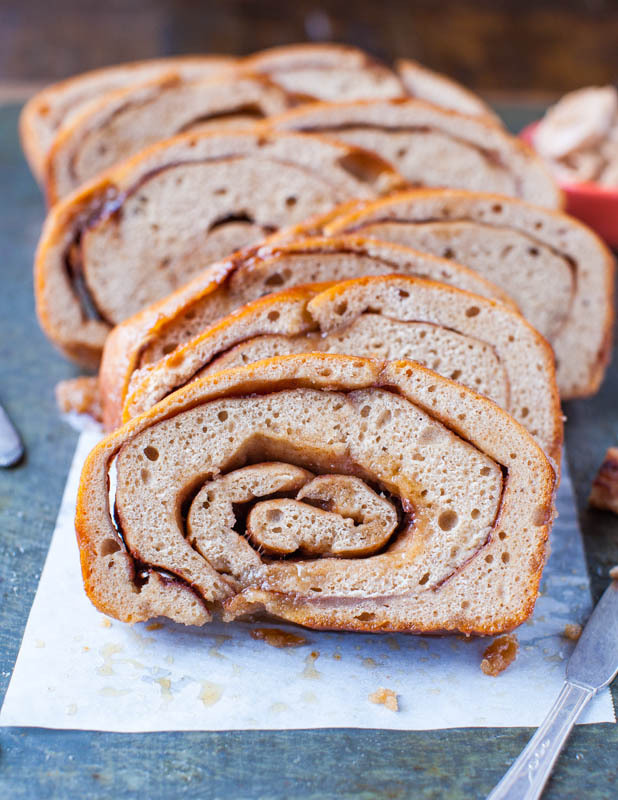 This cinnamon bread is as close to cinnamon buns as one can get and still call it bread, rather than dessert. I’ll take all the labeling tricks I can get if it means more of these sweetly swirled slices. 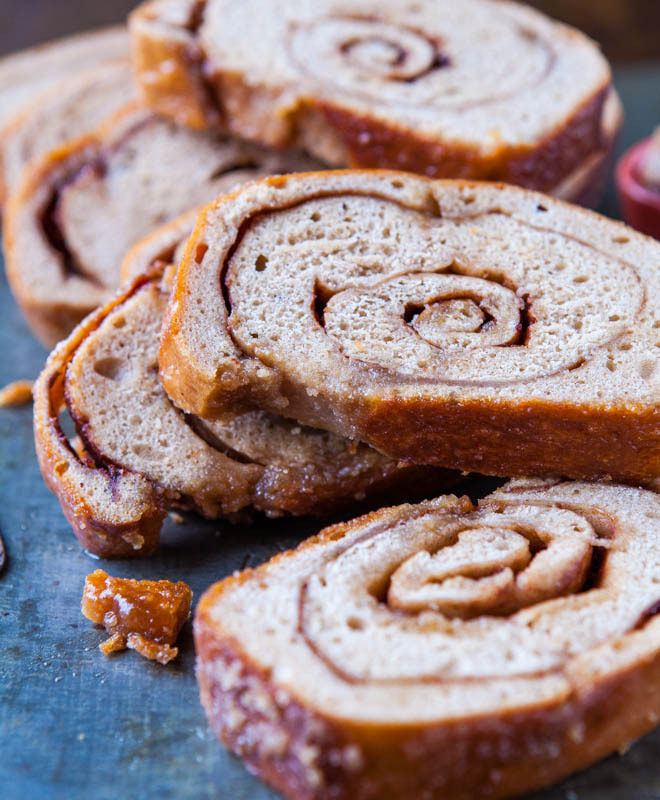 I grew up on my grandma’s cinnamon rolls and cinnamon swirl bread. Drizzling her soft cinnamon rolls with frosting or buttering a slice of her fresh cinnamon swirl bread, warm from the oven, are succulent memories carved in my mind and etched onto my tastebuds for a lifetime. What I wouldn’t give now to be able to go back in time to observe her make yeast-based doughs, entirely by feel, as she was legally blind and didn’t use written recipes. I have loose memories of watching her knead dough and as a child, I just remember thinking ‘how much longer til it’s ready’. Bread-making does require patience. This bread can be knocked out from start to finish in about three hours; not bad. If you’ve never made bread before, don’t be intimidated by this one because making the dough is easy and it comes together in minutes by hand. Then, find your patience pills because the dough rises for about ninety minutes and after the first rise, the dough is kneaded briefly before being rolled out into an elongated rectangle in preparation for it’s cinnamon-sugar rub down. I roll out the dough quite long, about eighteen inches in length, because the longer the dough is rolled, the more turns and coils can be made, resulting in more swirls in the finished bread. It’s a pet peeve of mine when cinnamon swirl bread is under-swirled and with this loaf, I took care that didn’t happen because the swirls are where the full complement of cinnamon-sugar hides. I’m no fool. After smearing the dough with butter, cinnamon, brown and granulated sugars, and then rolling it up into a plump dough log, it’s placed in a loaf pan, seam-side down, where it rises for about an hour before baking. Baking only takes about a half hour, the quickest step of all. It’s all a very do-able process but yes, it takes longer than nuking a TV dinner. Good things come to those who wait. No matter how tightly the dough is rolled, while the bread bakes, some of the luxurious filling will likely seep out of the well-stuffed coils. I could have been stingier with the butter or sugars, lessening the seepage potential, but that’s nonsense. I prefer to live in buttery, sugary abundance and slathered the dough with ample amounts of both. Just days prior to baking this bread, I was watching an episode of Ree making her famous cinnamon rolls, and I took a cue from the butter master and didn’t skimp. She advises that if you think you’ve added enough butter; stop and add some more. I love her logic. After the bread has baked, immediately turn it out from the loaf pan on a rack to cool, with parchment paper or a baking sheet placed underneath the rack. The drippy, sweet, caramelized buttery-cinnamon-sugar mixture that drained into the bottom of the loaf pan during baking needs to be redistributed back onto the bread. It will be tempting to drink that cinnamon-spiked butter sauce, or to eat the caramel bits that were created as the brown sugar and butter congeal and form a sweet, thick caramel sauce. Instead, pour or scoop the pan remnants over the top of the loaf, using a spatula as to not miss a drop of the liquid gold. Allow the loaf to cool and as it does, it will literally drip-dry, and some of the coating will magically reabsorb back into the bread. Then, wrap your sticky bundle of joy in plasticwrap before placing it inside a gallon-sized ziplock, which is how I store all my homemade bread, and it keeps for the better part of a week this way. Since I am such a cinnamon fan, I used cinnamon three ways; in the bread dough itself, and of course it’s in the cinnamon swirls, and I prefer this bread toasted with ample smears of cinnamon-sugar butter piled on, to really boost the cinnamon profile. 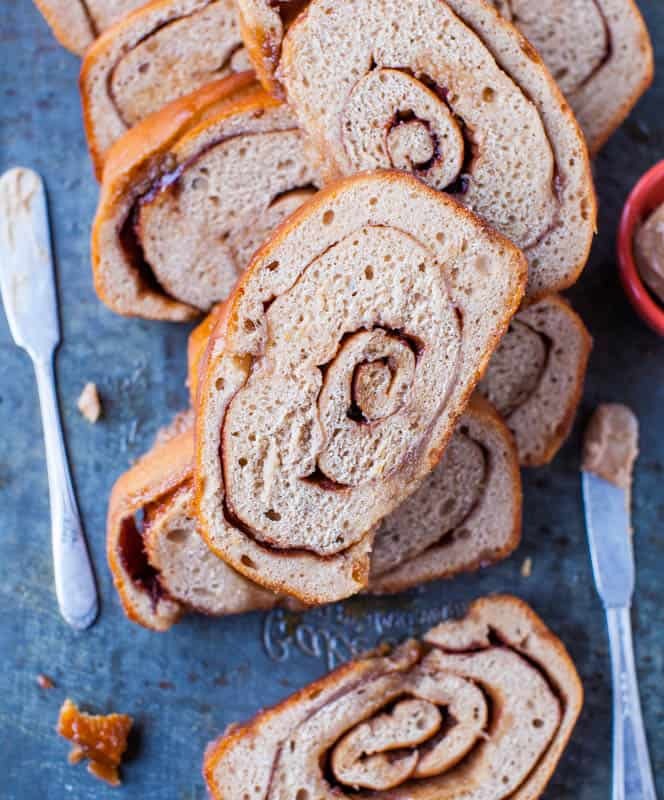 The cinnamon is complemented by the sugars; one accentuates the other, and it’s a match made in swirly bread heaven. In terms of density, the bread is in the medium range. It’s not a light and airy croissant but it’s not anywhere near as dense as the Cinnamon Raisin English Muffin Bread, as English muffins tend to be much denser than a loaf of bread is or should be. As I ate this bread, I was transported back decades earlier to my Grandma’s tiny kitchen and my childhood memories of eating her bread, slice after slice. Back then I took great pleasure in unwinding and unwrapping the coils and licking the cinnamon-sugar from them. Yes, I did. I didn’t do that with this bread, although I was tempted. Instead I just licked my fingers, which invariably become coated in the very sticky but very wonderful caramely, buttery, cinnamon-sugar sauce that seeps from the coils. What I love most about this bread, and with all swirled buns or rolls, is the keyhole center that peers back at me, buried amidst a web of concentric circles. Let’s face it, the best part of a cinnamon bun is the epicenter; the final coiled turn. It’s the softest, most tender, moistest, butteriest, and best bite of all. And eating my way into the perfect center bites of this bread was no exception. Active work time iis about 20 minutes, but there is a 90 minute rise, then a 60 minute rise, and 30 minutes to make. From start to finish, including baking, 3 hours is a realistic time frame. 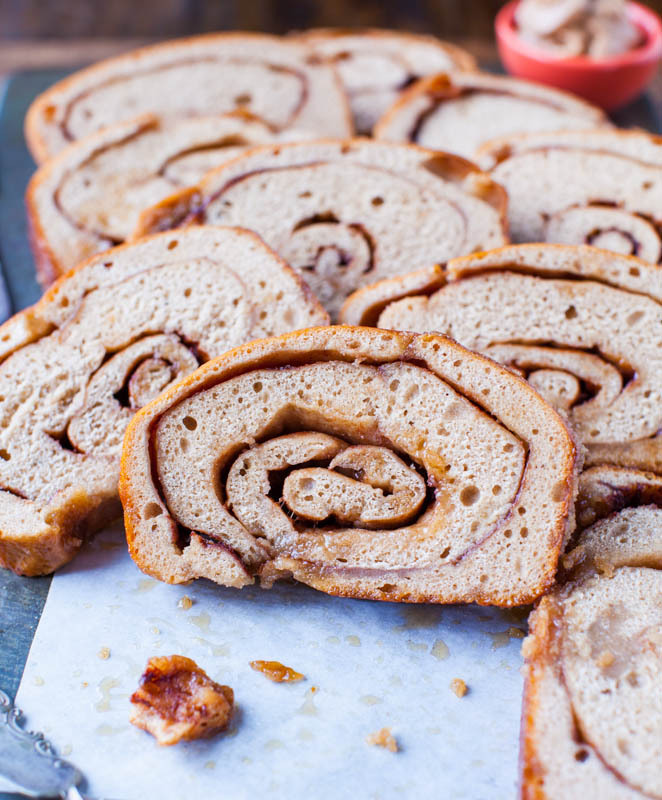 This cinnamon swirl bread is as close to cinnamon buns as bread can get. Filled with a sweet cinnamon-sugar and butter mixture that swirls throughout the loaf, this is a tender, buttery, sweet bread that even novice and new bread makers can successfully tackle. Whatever cinnamon-sugar-butter leaks from the bread inside the loaf pan while baking, including scrumptious caramelized brown sugar, can be poured over the top of the finished loaf, almost like the topping on sticky buns. For the Bread - In a glass measuring cup or microwave-safe bowl, warm the water to temperature, about 45 seconds on high power. Testing with a thermometer is preferred, but if testing with your finger, mixture should feel warm but not hot. Add the yeast, 1 teaspoon sugar, stir to dissolve, and let stand for 5 to 10 minutes. In a large microwave-safe bowl, combine milk and 1 tablespoon butter and heat until butter melts and mixture can be stirred smooth, about 1 minute on high power; do not allow the milk to boil. To the melted mixture, add ¼ cup sugar, 2 teaspoons cinnamon, salt, and whisk to combine. Add the yeast-water mixture and whisk to combine. Add 2½ cups flour and stir; dough will be wet and loose. Turn dough out onto a Silpat Non-Stick Baking Mat or floured work surface and knead in the remaining half cup of flour, adding flour just until the dough is soft and smooth. Knead for about 8 minutes. For the Filling - Spread 3 tablespoons butter over the surface of the dough with a spatula. Evenly sprinkle ¼ cup granulated sugar, then sprinkle the brown sugar, and then sprinkle 2 teaspoons cinnamon. Starting at one edge, carefully roll up dough into a loaf, rolling as tightly as possible. Pinch off the two ends and pinch together bottom seam as best you can, to prevent leaking while baking. Place dough into prepared pan, seam side down. Cover with plastic wrap and let rise until doubled in size, about 1 hour. In the last minutes of rising, preheat oven to 375F. Prior to baking, score top of loaf by cutting 3 or 4 diagonal slits across with a sharp knife, slicing about 1-inch deep. Bake for about 30 to 38 minutes, or until golden brown. Because baking times, dough, ovens, and conditions vary, keep a very watchful eye on the loaf because it will have a tendency to burn in the final moments. After baking, immediately turn bread out onto a wire rack and allow it to cool. Whatever cinnamon-sugar-butter mixture leaked in the bottom of the pan, pour it over the top and if the brown sugar has caramelized in the bottom of the pan, scoop out with a spatula and pour or spread over the loaf; it somehow re-absorbs a bit over time. Allow loaf to cool completely before slicing and serving. Store bread in an airtight container or ziptop food storage bag at room temperature for up to 5 days or in the freezer for up to 3 months. 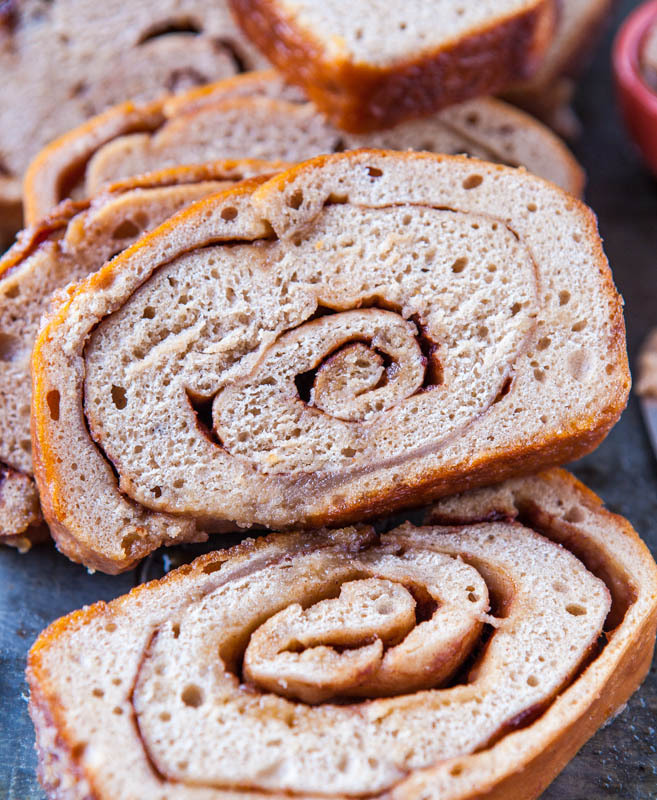 Do you like Cinnamon Swirl Bread or have a favorite recipe for it? Have you ever made bread with yeast? If you have any tips, tricks, thoughts, favorite recipes, or anything at all to add about bread-making, please feel free to chime in and link up your favorite recipes. Dscovering this whole new yeasty realm of baking and learning as I go has been so much fun. Even the less than stellar loaves I’ve made are better than storebought, they make great Overnight French Toast, and with each loaf, I learn something. 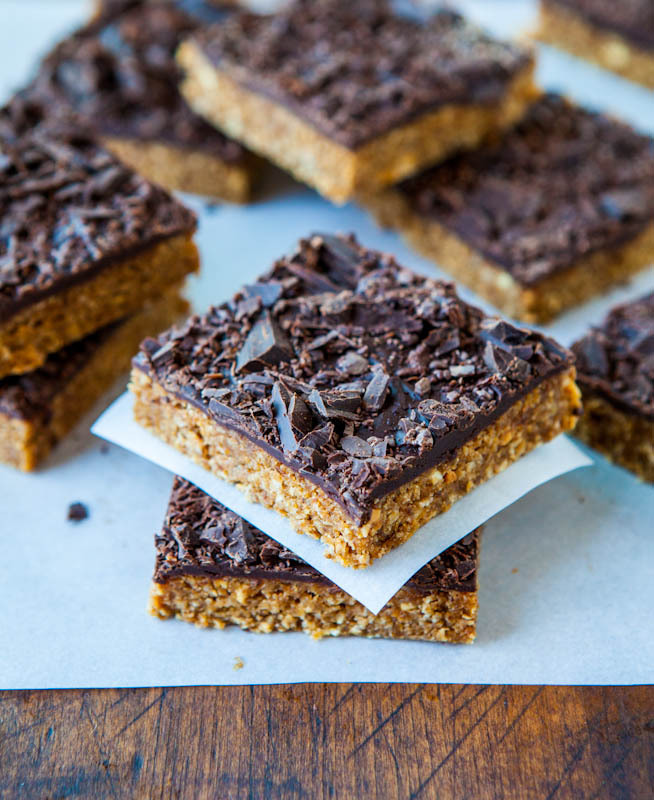 Kind of like making cookies and with each batch, you learn something about what works, what doesn’t, and what to try slightly differently next time. The process is almost as much fun as the product. Almost. This might be the kick in the pants I needed as I’ve had this on my to-do for aaaages. Just wrong of me I know. I can practically smell it through the screen! I have seen some of your breads on the Red Star Pinterest boards and just various pins from your archives and I was going to tell you how IMPRESSED I am with your bread baking skills! Seriously, gorgeous bread, Rachel! 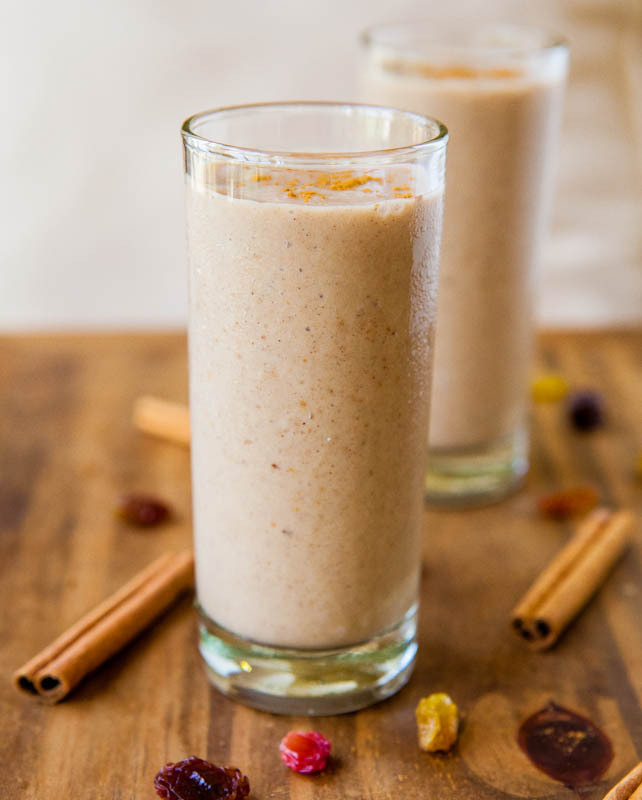 I totally agree with the extra cinnamon and vanilla, the more the better! Great looking bread, I can’t wait to try. Averie, just wanted to drop you a note and tell you I made your cinnamon swirl bread ( well sorta) LOL. I am an experienced bread maker even grinding my own wheat. I made your bread and the dough was wonderful. So easy to work with. Anyway – I rolled it out, put on the butter, and extra butter, brown sugar and white sugar and proceeded to roll it up – and pinch it off really tight so it would not leak -then into the bread pan – only to find out – I forgot the cinnamon! Oh My! So I quickly decided to split open the underside – pour in some cinnamon and try to seal it back up.My husband and MIL RAVED about the bread!! I can’t wait to make it the way it is supposed to be made! Thought you might like a laugh. I am so glad you made the bread and that it got rave reviews – and that’s crazy that you forgot the cinnamon and unwrapped it to add it! I have to say after my bread-log would have been rolled out all tight and neat, I wouldn’t have touched it but that’s great you had the inspiration to unseal it all! Thanks for the report back! This bread looks amazing! I’ve never attempted to make bread before but this has inspired me to try =) this is probably a silly question but I did just recently invest in a kitchen aid mixer… Can I knead this for 8 mins in that with the dough hook? Or does it have to be by hand? Thanks Averie! Dough hook all the way!!! Just watch it to make sure it’s hitting all the spots and nooks and crannies but 99% of the time, it does it’s job just fine. 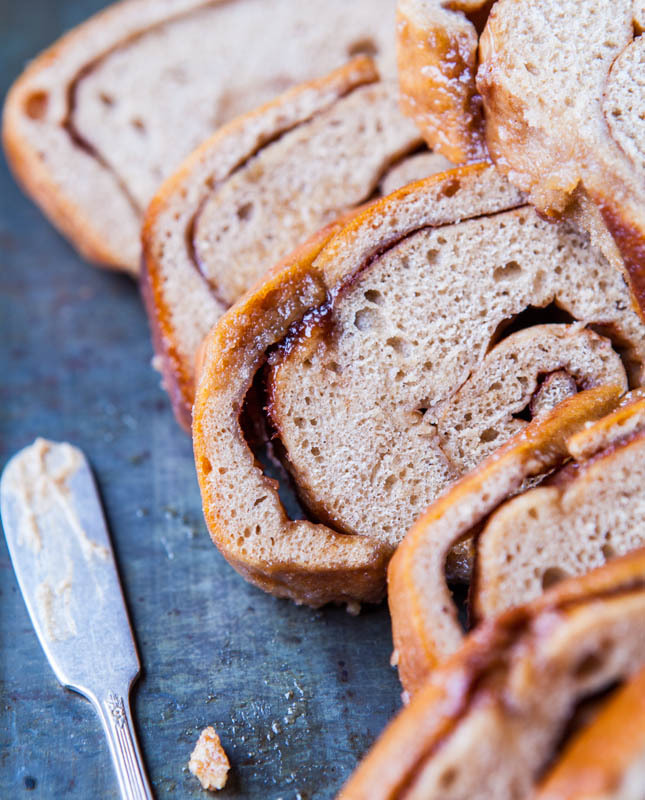 If you’ve never made bread before, this isn’t the easiest recipe only b/c you have to roll it into a log to get the swirl action, but other than that, it’s as easy as any other. Wow – so glad you’re inspired to try! Please LMK how it goes! My mother always made the best cinnamon rolls without icing which is not usually done in the south and I loved the cinnamon in them. She would make the rolls just like you do with buttering the dough and sprinkling it with the sugar/ cinnamon mixture and rolling it up. In her round pans she would butter the bottoms and then she would put a couple of tablespoons more of the cinnamon sugar and shake till it covered the bottoms evenly. She would put the cut rolls in the pans and sprinkle a little salt over each (just a little), Then she would add a small amount of white karo over each roll and from a lipped measuring cup she would add a small amount of water over each. After baking they would turn out to be the best gooiest cinnamon rolls ever. I think I may have to make some now! I love the idea of the Karo/water. I bet they’re so gooey and wonderful! This was my first yeast bread ever and my first attempt at one of your recipes. The bread turned out great, although I had difficulties along the way. I’m not sure what I did wrong, but my dough was super sticky. I used my dough hook for the first time instead of kneading by hand. Not wanting to add any more flour than it called for, I let it rise and hoped for the best. The best didn’t happen and it was a sticky mess after it rose. If I had tried to punch down the dough, my hand would have come out a gooey mess. Refusing to give up, I made the best of it and threw a bunch of flour around, was barely able to get it into a roll and then into the pan. Somehow, it still turned out great. It’s soft, moist and delicious. I’m going to be using this to make some awesome french toast in the mornings! Next up for me are your Overnight Cinnamon Rolls. YUM! You probably could have added more flour – it can be very weather and climate dependent and vary from brand to brand but I just saw your IG pic and it looks great! Used a few slices to make french toast this morning. YUM! much better than using regular ol bread. Oh. My. Goodness. This bread is amazing!!! I am so impressed with myself for making something this flippin good. Thank you!! Maybe you didn’t roll it super tight and now it’s expanding like crazy? Or maybe you just have super strong yeast? Not sure. As long as it doesn’t overflow onto/into your oven, I think it will still taste fine. Sorry, in my original comment I meant to say it got three times bigger during the FIRST rising, so its probably more an issue of the yeast and letting it rise for too long. Weirdly it only needed 30 minutes to bake, I would’ve expected more since it was so big. There was also not a drop of any filling leaked out on to the pan (or the oven, thankfully…). The shape is a little bizarre but I just tried a slice and it tastes great though, despite all the weirdness. Sounds like it over-proofed (rose too long during the first rise) but thankfully doesn’t sound like it effected taste and that’s great! I made this and must’ve done something wrong! When I was baking and it had ten minutes left on the thirty minutes the top of the bread was already turning brown! And since you warned that it could burn easily, I pulled it out. I kinda figured it wouldn’t be completely done in the middle and I was right. Top part was done but doughy in the middle. What did I do?? Help! Whenever something is browning too fast on top, simply cover the item with a sheet of foil (tenting the pan) and/or turn down the oven about 25 degrees. Homemade bread DOES tend to turn browner on top than what you may be used to seeing in stores, at least for me anyway. But I think if you tented it and continued to bake a bit longer the top would have been fine & the interior cooked through. I don’t know if I didn’t roll it tight enough or something? = Yes, I think that was the culprit if the top came off. Sometimes with rolled-up breads they can want to separate if you don’t roll them tightly. Also I think possibly you may have under-baked. Despite your oven running hot, it things don’t get to that perfect internal temperature, they can look done, but upon cooling they fall or collapse a bit. Not the end of the world usually with regard to taste but the appearance isn’t as pretty. I am thinking maybe drop your oven down by 25 degrees and/or tent with a sheet of foil in the last 20 mins or so of baking so it doesn’t get too browned on the top/sides if you try again. Glad it taste greats! Hi Averie – I made this bread a few weeks ago and thought I’d give you a little feedback on my experience. When I started making it, I noticed that the dough became very wet. I was weary as it looked way more wet than any other yeast bread I’ve made, but you said in the directions it was meant to be wet and loose so I proceeded. When I went to turn it out to knead it, it poured across the counter; I couldn’t even touch it (stuck to my hands and spread everywhere). I managed to salvage it by adding more flour (I think I added at least another cup or even cup and a half) until it was manageable enough to knead. It ended up baking up just fine and tasted wonderful, but I’m just wondering if anyone else has had this problem. I’m not sure where I went wrong as I followed your recipe exactly. Cheers! Thanks for the feedback and bread-making is VERY dependent on climate and also the type/brand of flour used. I live in a very dry climate and probably need much less flour overall than someone who lives in a more humid climate. And I always bake with King Arthur AP flour (or their bread flour if I’m making bread that I specifically note to use bread flour in). Flour brands vary widely in the amount of gluten they contain and those with less gluten, you’ll probably end up using a greater quantity of flour. So my feedback would be to use as much flour as seems appropriate for YOUR dough, your climate, situation, etc. I mean dough that is so sloppy wet you can’t work with it? Definitely add more flour, as much as you think is necessary. Trust your baking instincts! Glad the bread baked up great and tasted wonderful!